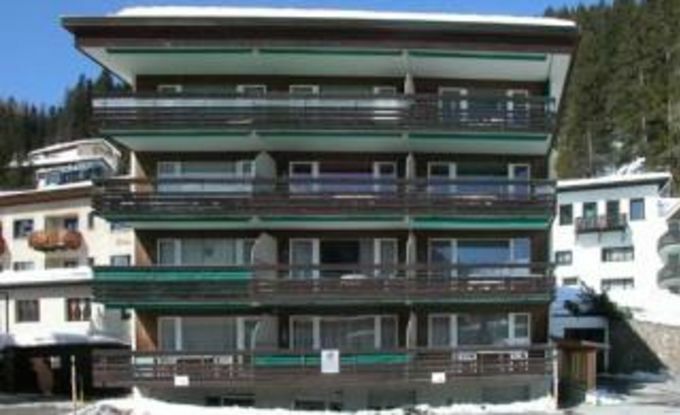 3 1/2 room apartment on the 2nd floor* (70m2), elevator, balcony, parking lot in garage (max. height 2.00m), skiroom, washing machine. Sep. kitchen with oven, refrigerator, dishwasher, coffee machine, bath/toilet, 2 bedrooms with 2 beds each(1 grand lit and 2 single bed), living- and diningroom with 1 sofa bed, children bed for kids to 3 years, bed linen, bath linen, kitchen towels, nordic cover, radio, TV, toilet-paper, rubbish bag (blue). "Check in" from 5.00 pm - "Check out" by 10.00 am Davos Platz, after the hotel Steigenberger Belvédère turn right to the Obere Strasse. The house is after ca. 400m on the right side. Key: Please contact the caretaker a few days in advance.